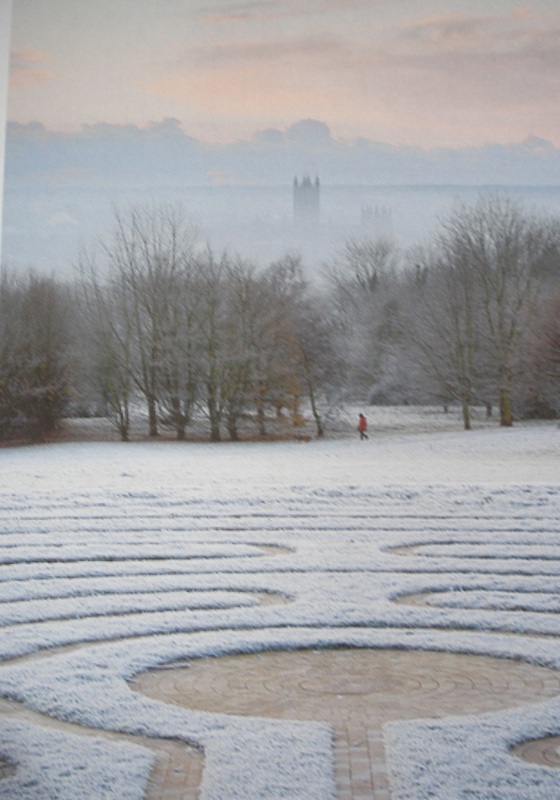 The Canterbury Labyrinth sits on the sloping campus of the University of Kent overlooking Canterbury Cathedral. It is a work of art, designed by Jeff Saward and constructed, using 8,000 pieces of hand cut York Stone, by Hayward Landscapes Ltd. Labyrinths can be used as tools for teaching; relaxation and reflection; therapeutic support; healing and spiritual development. Mazes were created to entertain, tantalise; indeed part of the fun is getting lost, but in a labyrinth there is one path into the centre and the same path out, and it is a place of peace where you are much more likely to find yourself. 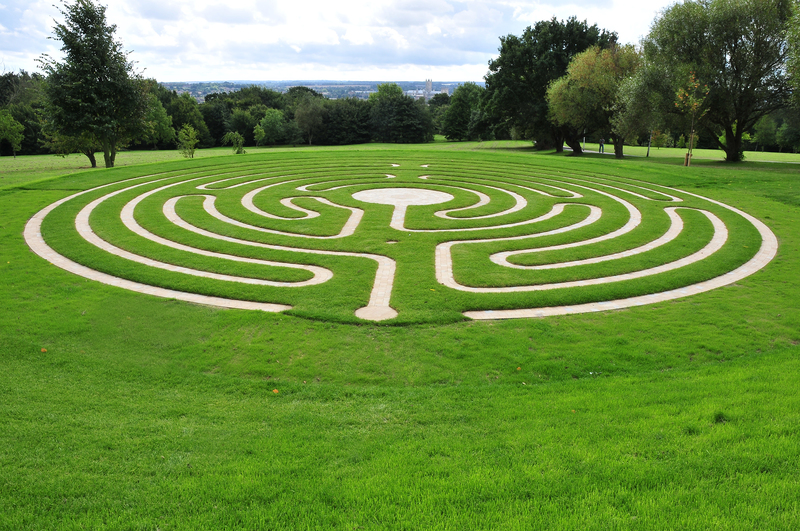 In the Canterbury area, there is a stone built labyrinth in a beautiful garden at the Pilgrim’s Hospice; an unusual grass labyrinth at The Pines in St. Margaret’s and a small labyrinth overlooking the sea on the grassy bank between Folkestone and Sandgate. In the Canterbury Labyrinth, I’ve seen students, staff and passers-by walk, run and even dance in the labyrinth, others doing yoga, meditation or simply enjoying a picnic in the peace of this place. Children love it and I watched one little boy walk backwards all the way into the centre and out. I worked with some clients who found it valuable to spend time in the labyrinth between their sessions, using it to facilitate meditation and reflection on their process of change. Some found it useful to write about their experiences and share them in the counselling. It can be an excellent way of beginning a regular meditation practice. People struggling with high levels of stress, anxiety or panic can, with practice, find peace walking in a labyrinth. 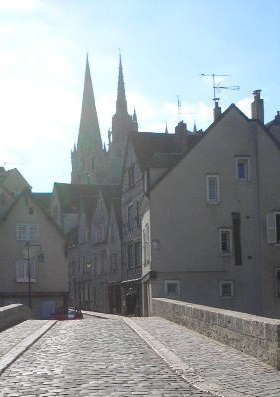 Others, on the Autistic/Asperger continuum seem to find such a walk particularly calming. Some clients describe feeling ‘held’ by the labyrinth while they are free to explore both the outside landscape and their own inner landscape. They’ve found the labyrinth both relaxing and stimulating; a place where they can ‘let go’ and safely meet ‘whatever is’ in those moments; a space where important questions may arise and be met with important answers. The labyrinth is a valuable tool for courses on mindfulness, well-being, creativity, overcoming work blocks and stress reduction. It was the focus for a group of graduates, leaving university, to think about what they were taking with them from their university experience. They each chose a stone, from a pile of stones placed at the centre, to represent a quality they felt they needed to take with them out into the working world. In every continent, except Antarctica, the symbol of a labyrinth has been found. On ancient Cretan coins; roman tiled floors; Etruscan wine jars; baskets woven by Hopi Indians; in Zulu children’s games. Labyrinths have been laid out in stones in Denmark; set in stone on the floor of European cathedrals; and are found on the plains of Peru. Britain has eight of Europe’s ancient turf labyrinths and three are cut into rocks in Cornwall. They have been used by people of different faiths and cultural traditions for more than 3,500 years and we are still learning much about their uses. • Releasing: letting go of the outside world as you walk into the centre. • Receiving: at the centre. This may be in the form of: an answer to a question; time to listen to ‘what is’ inside of you; or simply a few moments of peace. • Returning: as you walk out, bringing the experience with you whatever it is. When you do your first walk, it can be difficult to lose that self-consciousness about doing something new. Sometimes strong feelings may surface, at other times it can simply slow us down and bring us a sense of peace. People have imagined themselves walking around the labyrinth with close family members that have died; a moving and humbling experience. Others have been able to let go of negative feelings, traumatic memories and even repetitive thought patterns. Things can happen in a labyrinth! At first, it may simply be making time and space for a relaxing walk. What happens in a labyrinth may be seen as a metaphor that can help achieve self-awareness, e.g. getting lost; feeling blocked; walking along with a stone in your shoe and not removing it. When walking the labyrinth, we can walk barefoot or not; walk quickly, slowly or stand still; dance; sit or kneel down. There is no right or wrong way to move through a labyrinth. Artress, Lauren. 2006. 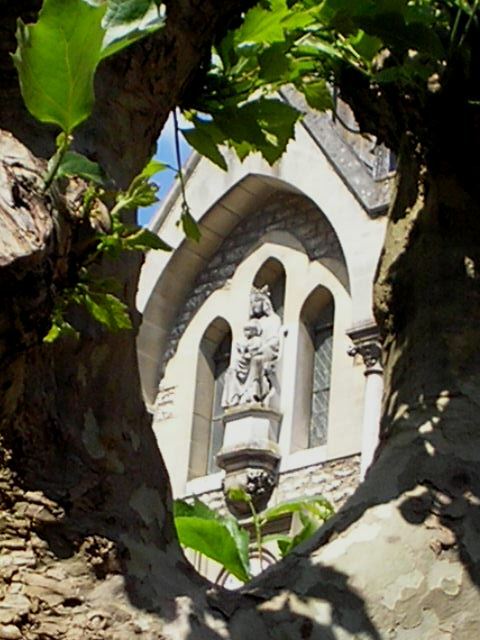 Walking a Sacred Path: Rediscovering the labyrinth as a spiritual practice. (2nd Ed.) New York: Riverhead. Artress, Lauren. 2006. The Sacred Path Companion: A guide to walking the labyrinth to heal and transform. New York: Riverhead. Curry, Helen. 2000. The Way of the Labyrinth: A powerful meditation for everyday life. London: Penguin Compass. Saward, Jeff. 2003. Labyrinths and Mazes: The definitive guide to ancient and modern traditions. Williams, D. 2011, Labyrinth: Landscape of the Soul, Wild Goose Publication. Have you ever walked in a labyrinth?